Cartrophen Vet has a history of over 20 years of safe use in the dog. Cartrophen Vet has a low incidence of side effects and of those they are mild and transitory. The number of reported adverse events on a per course basis (per 4 weekly injections) was 0.058%. Of total reported events, 50.9% were probably or possibly related to the administration of Cartrophen Vet. Hence the number of adverse effects reported that were possibly or probably related to a Cartrophen Vet treatment were 0.0296% or one adverse event reported per 3,300 courses administered (4 weekly injections). Based on the Hannon RL, et al. (2003) paper and information from the UK Veterinary Medicines Directorate, it is believed that 10 per cent of all adverse events for all products including Cartrophen Vet are reported. Hence for an estimated % of adverse events for a veterinary pharmaceutical the raw adverse event rates should be multiplied by 10. Based on commercial history, the number of adverse events reported in the horse on a per course basis (per 4 weekly injections) is 0.033% or one adverse event reported per 3,000 courses administered (data on file at Biopharm Australia Pty Ltd). The majority of adverse events related to poor administration technique. Cartrophen Vet is not an irritant at the injection site and like any injectable drug requires proper antiseptic cleaning of the injection site and appropriate needle selection and administration. In very rare cases, 5-15 minutes after the first injection a dog might vomit or be a little quieter than usual for up to 24 or maybe 48 hours. These transitory effects are rare and are only seen in some dogs. Overall the safety of Cartrophen Vet is well respected and understood after 20 years of use in dogs. Cartrophen Vet has a temporary effect on blood coagulation. Investigations in the dog of the blood clotting parameters activated partial thromboplastin time (aPTT) and prothrombin time (PT) following subcutaneous administration of 3mg/kg Cartrophen Vet on twelve occasions at weekly intervals showed aPTT increased 2 hours following administration but returned to near normal at 8 hours and importantly the extrinsic pathway of coagulation PT remained within the normal range. Substance-related local intolerance reactions (eg. haematoma) and evidence of systemic bleeding (eg. ecchymosis or gastrointestinal bleeding) were not observed, even at doses up to and including 30mg/kg applied for twelve weeks (10x the recommended dose and 3x times the normal treatment duration). With this drug’s pharmacological profile, bleeding would not be expected in an animal with normal haemostasis and Cartrophen Vet presents a low risk despite temporary effects on some clotting parameters (Data on file, Biopharm Australia Pty Ltd). Following intravenous bolus injection of pentosan polysulfate in the rabbit ear bleeding model, a minimal but significant haemorrhagic effect was observed at 3x the recommended dose of Cartrophen Vet. 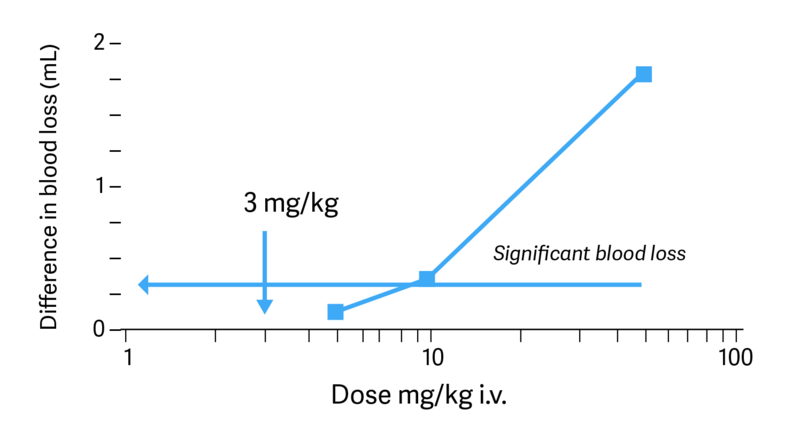 Pentosan polysulfate in humans and laboratory animals shows a mild anticoagulant effect, which is between one sixth to one tenth of the potency of heparin. However, pentosan polysulfate is a potent activator of the fibrinolytic system since it stimulates the release of tissue plasminogen activator from the endothelium. The net result of pentosan polysulfate on these activities is the dissolution of thrombotic emboli in blood vessels without a pronounced anticoagulant effect. Thus pentosan polysulfate, unlike heparin, does not exhibit a global alteration of the blood clotting system. Cartrophen Vet is subject to strict scrutiny for safety and efficacy by the regulatory authorities in every country it is sold. During clinical studies Cartrophen Vet has shown to be effective in 80% of cases. In a recent Japanese open clinical study, according to the veterinarians’ impression, 96% of cases improved with Cartrophen Vet treatment (Data on file at Biopharm Australia Pty Ltd). Cartrophen Vet has shown to be an effective arthritis treatment during over 20 years of commercial use and millions of administered doses. How quickly does Cartrophen Vet work? In a comparator study between Cartrophen Vet and the non-steroidal anti-inflammatory (NSAID) carprofen, Cartrophen Vet was shown to have results equal or superior to that of carprofen in the relief of pain and lameness in clinical trials that are. This is the first time a disease modifying osteoarthritis drug (DMOAD) has been proven to offer significant pain relief comparable to that afforded by NSAIDs. Cartrophen Vet has a slightly slower onset of ameliorating effects but longer persistence of these after the recommended four-week course of treatment. Cartrophen Vet (100mg/mL of pentosan polysulfate sodium or PPS) has been used in the horse for over 20 years at 2 – 2.5mg/kg of PPS (10mL vial per 400-500kg horse) and has shown to be a dependable and safe product. Pentosan polysulfate is receiving recognition for its positive role in treating equine arthritis and traumatic joint disease. With many of the same metabolic pathways as in dogs, Cartrophen has a positive role to play in effective treatment of OA in horses. At the 2008 International Congress of World Equine Veterinary Association Dr C McIlwraith of the University of Colorado State said the following about pentosan polysulfate. “Recent work from our laboratory has demonstrated favourable results. Using the osteochondral fragment-treadmill model of equine OA in the carpus, there was significant decrease in articular cartilage fibrillation and a strong trend for overall cartilage histologic appearance (modified Mankin Score). Furthermore, most other parameters showed numerical improvements (including lameness, joint flexion, synovial fluid, TP, synovial fluid collagen degradation products and aggrecan synthesis) although statistical significance less than 0.05 were not obtained” (McIlwraith, 2008). 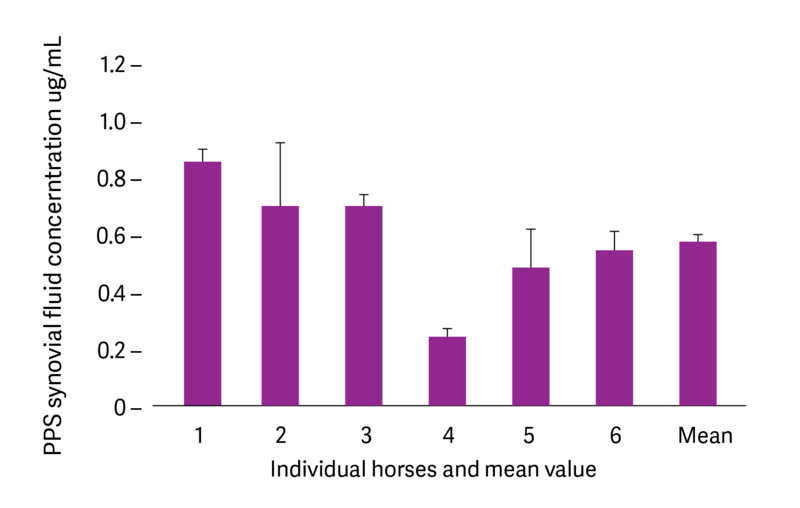 Clinical trial data shows that horses administered Cartrophen once a week for 4 weeks at an average dose of 2.2mg/kg had improved lameness and pain scores during treatment (Weeks 2, 3 and 4) and two weeks after treatment (Week 6). According to the veterinarian’s and owner’s impression of treatment, at least 60% of cases responded positively to the treatment (Data on file, Biopharm Australia Pty Ltd). Pentosan polysulfate (calcium salt) at 2mg/kg was administered by intramuscular injection into six healthy horses in a university study. Synovial fluid was collected from the mid-carpal joint at 4 hours post-injection. The mean concentration in synovial fluid was 0.6μg/mL, which on the basis of published studies, falls in the range reported to stimulate chondrocyte synthesis of proteoglycans and fibroblast synthesis of hyaluronan. This concentration may also be sufficient to inhibit neutral metalloproteinase (MMP)-3 and increase tissue inhibitor of metalloproteinase (TIMP)-3. It was proposed that pentosan polysulfate bound to connective tissues acts as a reservoir for the drug meaning that pentosan polysulfate does not need to be present constantly in the plasma to achieve its effects (Fuller et al., 2002).